Anthem MRX 510 review | What Hi-Fi? Are you willing to sacrifice features for performance? That’s the question you need to ask yourself before you consider buying this Anthem home cinema amplifier. While the MRX 510 has the connectivity to slot into most existing multi-channel set-ups, it doesn’t have anywhere near the frills of a typical £500 amplifier let alone one at its elevated price point. The story is much the same with build quality. It’s a good, solid unit and neatly made, but there’s little here in terms of heft or finish that suggests it’s an upmarket product. The remote is nice enough though. It looks like a basic unit but is simple to use and relatively nice to hold. Want network streaming ability or Bluetooth connectivity? You have to look elsewhere; the Anthem doesn't even have enough on-board processing to work the automated set-up procedure, though - unusually - there is a high-quality microphone and stand in the box. The company’s dedicated set-up software needs to be loaded onto a PC (note, there isn’t a Mac version) and performs all the usual level and equalisation functions. Your computer has to be on the same network as the receiver for everything to work. We would expect the selling dealer to perform the install, but if you decide against that, it’s a fairly simple procedure provided you have a certain amount of confidence in your own technical ability. Oddly, the system doesn’t set speaker distances; these have to be entered manually. Apart from that, the software is sophisticated and gives plenty of adjustment as far as countering room effects and speaker foibles goes. It’s a tweaker’s paradise, but works well enough if left to its own devices too. Once up and running, this Anthem amp is something of a star. Don’t let the low power rating of 7 x 75 watts power rating fool you - it seems as though the company has been more realistic with its power ratings than most rivals usually are. We notice little difference in outright grunt when comparing the MRX 510 to similarly priced opposition rated at around double that power. Given a bombastic film like Pacific Rim, the Anthem shines. Play any of the film’s (many) robot-versus-monster fight scenes and this amplifier responds with plenty of punch and authority. Surround effects are panned with skill and stability, and the overall sound field is decently large. Detail levels are high with the amplifier uncovering layers of information in the most complex of scenes. Tonally, things are spot-on – as would be expected with such capable set-up software – and there’s none of the veiled quality and lack of low-level dynamic expression such equalisation normally adds. We like the top-to-bottom consistency too and the amplifier’s ability to keep its composure when things get demanding, even when volume levels head northward. While impressive, it’s not the Anthem’s way with large-scale action films that makes it stand out among good upmarket home cinema amplifiers. Most do that really well. To find out what makes this amplifier different you’ll have to move to smaller scale soundtracks; those that need finesse to sound good. A film like The Secret Life Of Walter Mitty works wonderfully. Dialogue is delivered with confidence and subtlety with nuances in voices communicated superbly. The Anthem’s midrange is crisp, clear and focused, and has enough in the way of natural warmth to convince. 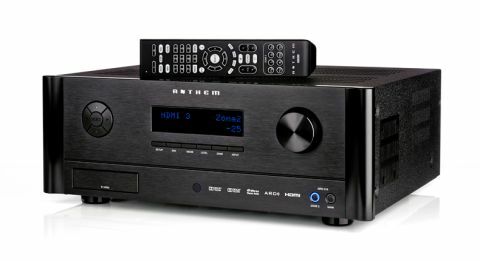 With music - whether stereo fed from an Audiolab 8200CD CD player or our resident Marantz UD7007 Blu-ray source – the MRX510 delivers a lively, dynamic sound that positively brims with drive. Here, at last, is a multi-channel amplifier that sounds properly good regardless of how many channels are in use. It has strong dynamics, a lovely consistency throughout the frequency range and even does a grand job presenting the rhythmical elements of a track. Want an AV amplifier that plays music well? This Anthem is it. Some will look at the spec sheet and decide the Anthem isn’t for them, and that’s fair enough. In many ways, it struggles to better the feature sets of most budget amplifiers, let alone those closer to its price. Yet, judge an amplifier on sound performance alone and it becomes clear that this is one of the standout products below the two grand mark. A home cinema amplifier that can keep music lovers happy too – that is a rare thing indeed.